Maps of the Earth's Children Series - Maps include the Land of Painted Caves journeys, maps of The Territory of the Zelandonii, Journeys in Clan of the Cave Bear, local area around the cave in Clan of the Cave Bear, The Valley of Horses, Iron Gates map, local map of the Sharamudoi, local map of The Mammoth Hunters Lion Camp, map of The Ukraine, map of The Plains of Passage, Clickable map of the Plains of Passage, Donau Mouth to First Snow from the Plains of Passage, The Encounter with the S'Armunai, the true extent of the ice in the last ice age, as well as the Wurm and Riss Glaciation in the headwaters of the Donau (Danube), How I draw the maps.. Many people print out the maps for the relevant books and glue them to the front and/or back covers, so that they can more easily follow the journeys as they read the books! Location maps of archaeological sites and cave paintings. A new base map of archaeological sites in the south of France has been added. All of Ayla's journeys are on this map, up to Shelters of Stone. Jondalar and Thonolan pretty much followed the same course when going east, except that after the time with the Sharamudoi they took a boat down the river to the delta. Then after leaving the delta and Willow Camp they would have followed pretty much the same path as Jon and Ayla did on the journey to the Zelandonii, and finished up at the Valley of horses. Go to the clickable map of all of Ayla's journeys - click on the camera icon and see the particular area . This includes the Sharamudoi journeys, as well as a map for Archeology students without Ayla's journeys. The Causes of the end of the last Ice Age: The last great ice age began around 120 000 years ago. One massive ice sheet, more than 3 kilometres thick in places, grew in fits and starts until it covered almost all of Canada and stretched down as far as Manhattan. Then, 20 000 years ago, a great thaw began. Over the following 10 000 years, the average global temperature rose by 3.5° C and most of the ice melted. Rising seas swallowed up low-lying areas such as the English Channel and North Sea, forcing our ancestors to abandon many settlements. Go to the maps of the extent of the ice in the last ice age. A set of maps illustrate how the last British ice sheet shrunk during the Ice Age. The unique maps record the pattern and speed of shrinkage of the large ice sheet that covered the British Isles during the last Ice Age, approximately 20 000 years ago. The sheet, which subsumed most of Britain, Ireland and the North Sea, had an ice volume sufficient to raise global sea level by around 2.5 metres when it melted. 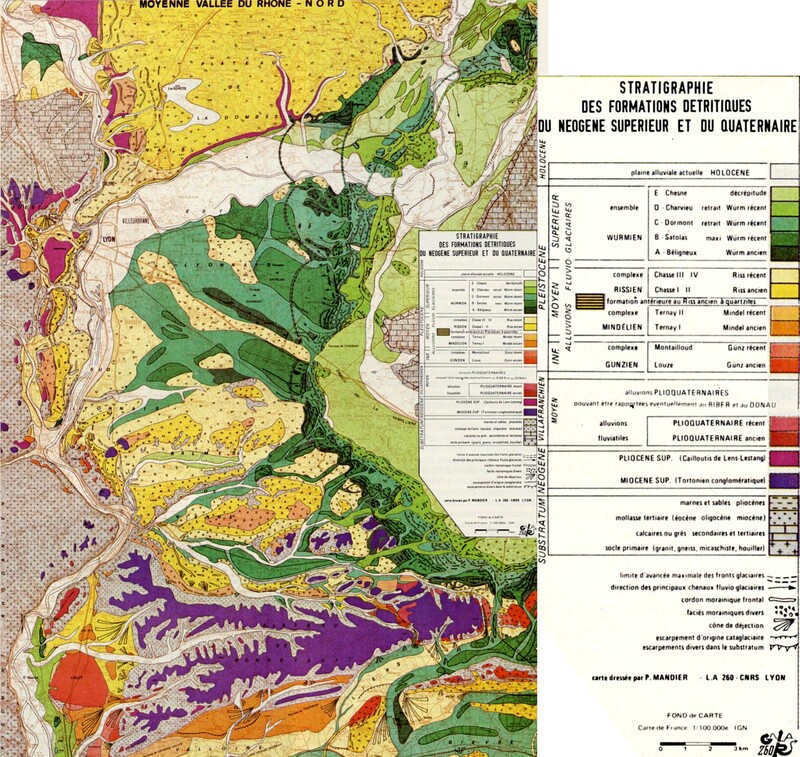 Go to the map of the Wurm and Riss Glaciation deposits in the Rhone valley.